As we enter the waxing phase of the moon and I reflect upon the first baby steps of my own that I can take on my New Moon Intentions, the words “stepping outside of my comfort zone” kept coming to me. One of my New Moon intentions is to be bold – her energy came to me spontaneously while going through my own monthly New Moon lunar rituals. 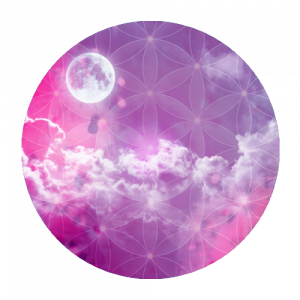 It seemed so fitting for this expansive Summer time energy and I loved the idea – yet now at Growth Moon and it is time to begin moving on my intention of being “bold” , there is a part of me that is not so sure. So how can we step outside of our comfort zone and still stay authentic and true to our spiritual selves? Here are some ways I have found that work for me and that showcase really well how flower essences and true heart connection with another can help us move forward with more grace and ease. 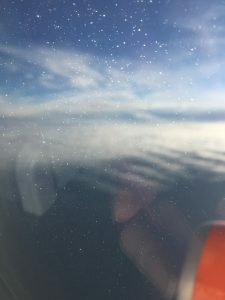 Earlier this month I flew to Belfast to attend a course – I was so looking forward to going yet there was one small thing I had to do to get to Belfast and that was get on a plane – and I really don’t enjoy flying. I have flown a lot in my life – to Australia, to China and countless flights around Europe yet I am still way out of my comfort zone on each occasion. I have used a zillion different types of complementary therapies to help me – many of them I am sure have helped- yet the fear still remained. The fear has never stopped me but it has really restricted me. For years I would hide my fear, pretend I was okay and drink on the plane (I very rarely drink any alcohol so you can imagine what a glass of wine was like for my body 35,000 up in the air). This sort of worked but would I arrive feeling dreadful and disconnected – and then when I had to come home, the fear would begin all over again. – I found myself in tears at take off explaining to the person sitting next to me how scared I was. Instead of suppressing my fear, I allowed myself to experience it and express it. – I decided not to drink and have never been so glad to touch down in Berlin and get off the plane. At the same time instead of feeling dreadful, I was jubilant and can remember inwardly praising myself for my courage over and over again. On arrival in Berlin I felt like a child and so very joyful for having allowed myself to have this experience. 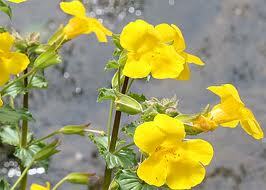 This was indeed a breakthrough and indeed Mimulus had helped me find courage to feel my fear and not to be afraid of expressing it. Fast forward 4 years and again I find myself needing and really wanting to fly to Belfast – once more I find myself facing my fear and this time turn to a friend of mine, Ruth Fox – http://www.ruthfox.co.uk/index.html – who specialises in EFT (Emotional Freedom Technique). Several sessions with Ruth later, I still do not enjoy my experience of flying overly, but the fear is less, I can hold conversations with the person sitting next to me and most importantly I allow myself to be supported and held by the extraordinary plane and the air spirits who hold the plane as the travels through the skies. Again this is a breakthrough yet this time it is a magical breakthrough – I feel empowered, liberated and full of gratitude to Ruth, to the plane and most of all to the beauty of the earth that I am privileged to see from the plane. EFT most certainly helped me as a process to reduce the level of fear in my body yet what stays in my heart as the over lighting part of this is my connection with Ruth. Ruth was able to hold a space for me to really feel my fear and in this space, she tapped (no pun intended here) into my need to connect with the elementals who overlight the plane, and the sylphs/ the air spirits. And in this space I found a doorway into feeling the support of the elementals and allowing myself to be supported. So as we enter Growth Moon and you find yourself needing to find courage to step outside of your comfort zone – my encouragement and experience is for you to find the courage to allow yourself to feel your fear/your resistance/your stuckness and by dropping down into this energy, an opening will emerge. Very often we need another to hold this space for us and this too takes courage – especially if we have spent lifetimes coping on our own. Red Rose – is a flower of courage. She holds our hand and whispers words of love and encouragement as we walk forwards. 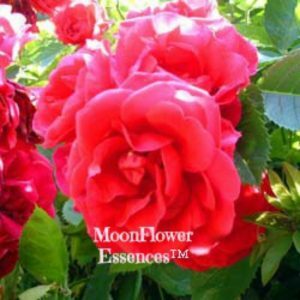 When you use Red Rose as a flower essence, you find yourself looking back and wondering why you had ever worried about taking that fearful step. Red Rose really does make the journey feel so much easier. I’d love to know how you support yourself when you need to step outside of your comfort zone and so please do leave a comment on this blog and share this with me and others.